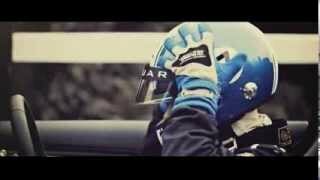 Jaguar has officially unveiled their Project 7 concept which will make its debut at the 2013 Goodwood Festival of Speed. Project 7 is based on Jaguar's acclaimed F-TYPE. The Jaguar Project 7 is an aluminum-bodied roadster. 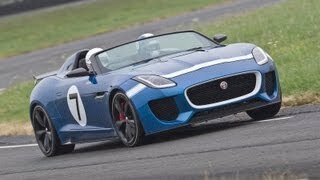 Project 7's name acknowledges Jaguar's winning of Le Mans seven times - a record for a British manufacturer and its blue paintwork is reminiscent of the victorious Jaguar D-types. Exterior changes include bespoke carbon-fibre components – a new front spoiler, side skirts and rear diffuser, lowered windshield and restyled front bumper. There are also 20-inch alloy wheels with Pirelli P Zero tires. Project 7's unique interior features a composite single-seat with racing harness, a helmet holder and custom trim. The fully-functional, high performance sports car receives a supercharged 5.0-liter V8 engine that produces 550 HP (405 kW) and 680 Nm (502 lb-ft) of torque. It is connected to an eight-speed Quickshift transmission enabling the Project 7 to accelerate from 0-100 km/h in 4.2 seconds and hit an electronically-limited top speed of 300 km/h (186 mph).